The Wizard's Council of Tarador was supposed to tell young Koren Bladewell that he is a wizard. They were supposed to tell everyone that he is not a jinx, that all the bad things that happen around him are because he can't control the power inside him, power he doesn't know about. The people of his village, even his parents, are afraid of him, afraid he is cursed. That he is a dangerous, evil jinx. The Wizard's Council didn't tell young Koren, because they know what is best for him. Even after their silent deception destroys his life. Crown Princess Ariana Trehayme will become queen of Tarador on her 16th birthday, if her weak, indecisive mother the Regent hasn't allowed their ancient enemy to conquer Tarador before then. 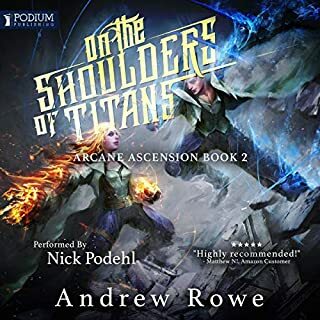 Ariana wants her royal army to strike at the enemy, but her mother knows what is best for her, and the realm.Together, Ariana and Koren can save Tarador, if the adults, who know best, will get out of their way. - Gossip is always wrong. If you even hear someone gossiping, their IQ has been reduced to 0 for the duration of that conversation. I dont know if the people in this world understand a damn thing going on around them if they are talking about it to eachother and the main character is listening. - When people learn their lessons or compare whats happening to them to their own lives, they seem to both understand the lesson / methodically do it again without even having a clue. They will almost literally be like: "I should not have stuck my head into that bears mouth" WHILE sticking their head into the bears mouth. Its so consistent that I have to believe the author is trying to make a point about peoples decision making skills, because there are points where the sentence structure is almost exactly that! - Life isnt just unfair, its methodically unfair. I really enjoyed the book and the story, but I am also just waiting for when he snaps and starts killing or blowing up all his problems. I feel like its coming and the satisfaction will be immeasurable. I found all of the characters once they left their hometown to be very one dimensional (Good, bad etc). As well I found the overall story arc to be incredibly predictable with none of the plot points being surprises or new as I felt they were all just rehashes from other successful fantasy stories. Overall I found it to be an interesting concept (a Hero's Journey will always get me as a good hook with a call to action) but overall it was quite disappointing. I will stick to Craig's Sci-Fi stories from now on. The thing I liked most about this book was the humble yet powerfulness of the main character. I also really enjoyed how well the story points come together in the end and the emotional roller coaster this book took me on. 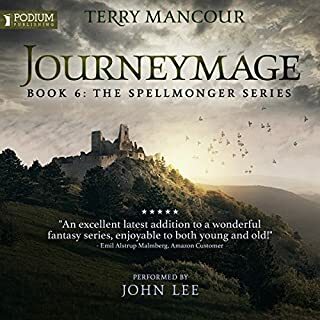 If you enjoy coming of age stories and fantasy books you'll enjoy this book. This book is a testament to the fact that great books don't have to be complex. There is a good twist in this book but for the most part it has a fairly simple plot. The characters are great and the narration is superb. Craig Alanson really understands his characters and gives us a sense of the inner workings of the mind of a child. 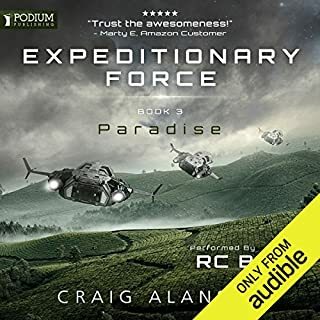 I enjoyed the simplicity of the plot as it enhanced every other area of the book #Audible1. Technically not geared towards a youth audience, but could (or should?) be. 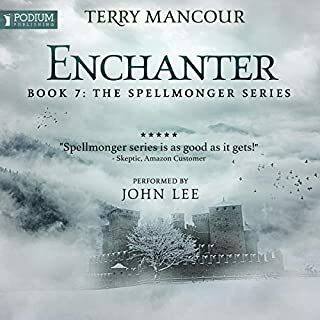 It is a great story despite the generic fantasy themes and occasional lack of creativity (a character names Chuwing from the distant land of Chindo...). I would recommend this light and enjoyable read to adults and strong readers in the youth category (Ages 11+) alike! Would also suggest this would be a fun family read/listen for your next car trip or family activity. 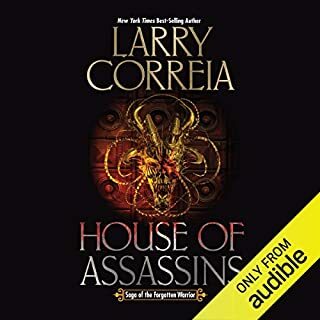 Looking forward to reading/listening to book 2! Very much enjoyed it. and the narrative was superb. highly recommend you give a listen. I couldn’t stand the narrator , sounded like I was being read a children’s book. Paid for it, but had to delete it. Honestly, I am not a passionate fan of the sword and sorcery fantasy genre. 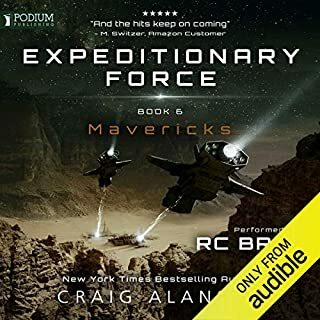 I am a huge fan of the Expeditionary Force series and RC Bray's narrating. So it was with quite some hesitation that I purchased this book after listening to what I felt was a lackluster uninteresting preview. I wasn't convinced the story or narrator would be a worthy investment of my time and money. I preface this review with my doubts not to troll the author or the narrator but to give context for my review. First, after having completed this book I can't imagine a better suited narrator for this story. 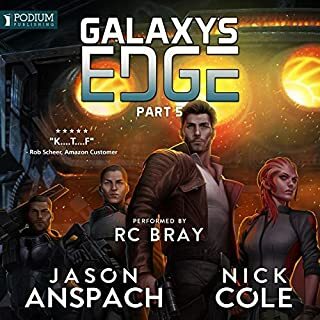 The narrator quickly dissolves away into the story and there are only a wide variety of characters and adept accents left. Production value was very good. There were no noticiable splicing of vocals, popping, lisping crackling "ssss", or sharp audible inhalations from the narrator that are still far too commonplace in audio production these days. 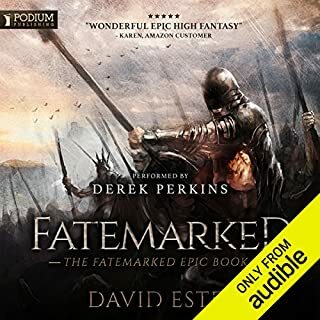 The story is a well tested, well worn one but the relateable and developed characters make it easy for the listener to be absorbed into the environment as an observer. 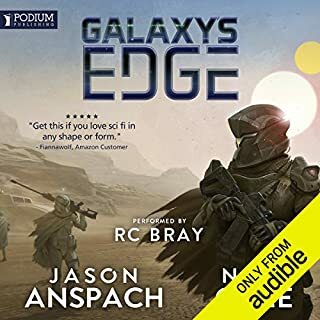 I am pleasantly surprised at how much I enjoyed this story and can't wait to listen to book two. I have to say this isn't like Craig's other books. Instead of aliens this is a deep rooted world of magic, wars and outlaws. I guess it just goes to show the imagination of the author is quite wide. The book is entertaining and I found it enjoyable. However it could due with a bit more humor. But then again i'm a Skippy fan. This was a really well written first book in a series. It's definitely at the high end of the quality spectrum from the writing and story-telling angle. My reservation... I have read or listened to quite a few books whose major plot points are repeatedly driven by misunderstandings, characters accidentally over-hearing the exact wrong information at the exact wrong time, and characters inexplicably not revealing pertinent information that otherwise would bring resolution instead of conflict. In other books this usually happens "because reasons" or with no explanation whatsoever. With a book where this happens over and over, I usually make it about 4 hours in and then return it with prejudice. It's almost always lazy story-telling and so frustrating that I find myself wanting to choke the author for wasting what would otherwise be a good book. In the case of Ascendant, the author manages to make it work (most of the time). These coincidence fails are overtly portrayed and mostly adequately explained. As a result I was able to enjoy the book and was only really in a choking mood a couple times... That said, if the inexplicable repetition of unfortunate coincidences continues through book 2 as the only device to move the plot then I'm pretty sure I won't be able to hang in for book 3. My fingers are crossed because I really did enjoy this book. First, I did not like the predictability of the story, there was never a twist in the story that made my think "wow didn't see that one coming". I have never been a real big fan of Tim Gerard Reynolds in the first place,it just drives me crazy how he just always seems to read so slow. Like he always pauses after every sentence or phrase for a few seconds longer than it needs to be. 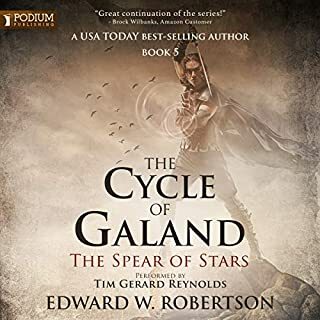 i have listened to many other books that Mr. Reynolds has performed in, including Riyria Revelations, Riyria Chronicles, and The White Tower and only noticed it when i played it along with, or back to back with other readers. Unfortunately this initial installment kept beating us over the head with just how unfair Koren Blackwell’s life is. Seventeen hours of misunderstandings and lies all to keep one very likable young man from his destiny! This book simply needed a good editor. It just seamed like The whole premise that a 13 year-old saves the world again in fantasy fiction books is getting very old. The whole premise that a 13 y/o saves the world again in fantasy fiction books is getting very old. With that said the book is actually a good listen. the performer is really good once you get used to his style. I found the story good, &quot;Spoiler&quot; and of course there is a 13y/o to 13y/o love interest (peasant meets princess) and the 13y/o princess has a superb tactical mind...whatever. 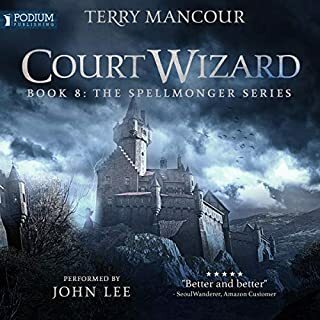 I will listen to the next one because I like the author's previous books and I could use a little Joe Bishop and Skippy right now the whole teen down on his luck but is really the most powerful mage history is tiring. Jesus Christ. No payoff, arbitrary cliff hangers, and all of the characters are completely useless. 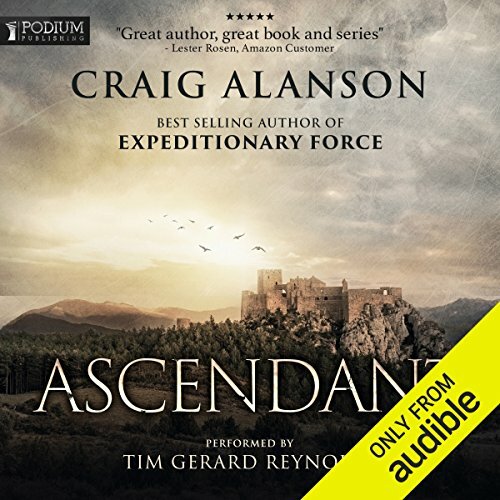 When I read or listen to a story, I really, really want payoff, not become enthralled halfway through only to find the characters see no real personal growth, and that the extremely cringy and convenient 'misunderstandings' the MC goes through make me want to not only delete the audio book, but burn the entire damn computer it was streamed on. I have never been as frustrated or as disappointed with a story in book form. It's only literal saving grace is that the ending of this book is still not as bad as the terribly written ending to Mass Effect 3. But as God is my witness, Ascendant is a close 2nd in my eyes. 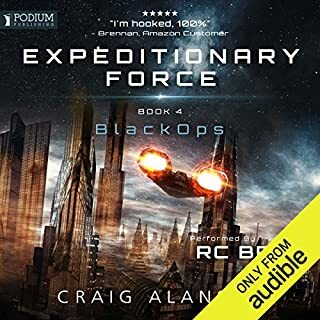 I do like Expeditionary force series by the same Author, and as long as the Author doesn't muck that up with cringy plot convenience, I will buy it. But not one more from this series. I'm still mad as I write this review at 11pm when I have to be up in 4 hours. And I can feel that trend continuing in the second book, I may be wrong, but I doubt it. He's such a good kid, it hurts me to much to watch his soul get tormented again. But I guess if your into that, have at it. Before purchasing this book, i saw a review mentioning how the author over used the power of the "Misunderstanding" to advance the story. And that review highly undersold what I was getting in to. Every page, or so it seems, has another lie or misunderstanding or etc that affects the characters and forces us down paths that are critical to the story but are just frustrating as a reader. And this fact nearly wrecks a very enjoyable story. But how we go down the path shouldn't really take away from how enjoyable the path is to walk. The characters are well developed. The world is well developed. The speed is right and the emotion is strong. In fact, and this is the only benefit of the previous paragraph, is that you begin the start getting angry for Koren at all the misleading. Which really creates the bond between you and Koren. But the other characters are just as like-able, hate-able, and fun to get to know. And Alanson does a great job of connecting you to them. Now, the story is a little predictable and isn't anything all that new, but it's still a highly enjoyable ride that i'll enjoy continuing on. Waste a credit, don't pay. Tim Gerard Reynolds is his usual great self. Can't talk him up enough. Definitely not something Joe Bishop would like. Obviously this story is not anything like ExFor and I didn't expect it to be. 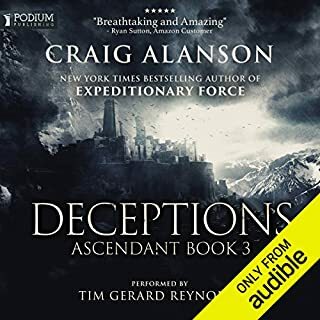 Alanson's foray into fantasy is interesting nonetheless. I'm actually only a little past halfway through and the story is dragging. Luckily Alanson is a good enough writer and T.G. Reynolds is a good enough vocal performer to make "run-on" interesting enough to keep listening. I know there's a good story in here. I just wish it would develop quicker. Unlike GoT there is only one storyline following a 12-13 year old boy and I'm starting to wonder if this series will be written in real time. Imagine listening to a Game of Thrones novel and it only followed one character and lasted just as long. 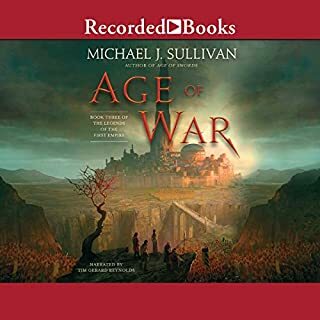 However if you're looking for a long audiobook so you have something to listen to for a long while, you could do a lot worse. T.G. Reynolds makes it a pleasant listen and the story is good albeit a little too drawn out in places. 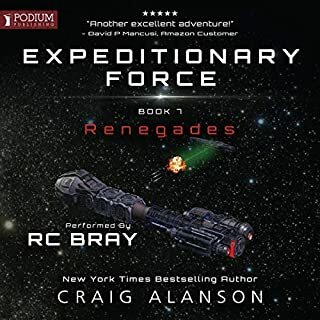 I loved the Expeditionary Force series by Alanson which was witty, well written, and original and I can not believe that this came from the same author. I wanted to stop listening after the first hour but was sure that there would be a novel twist, or something that would explain the poor writing and lack of an originality; I thought, even hoped, that it was an elaborate parody of the genre because the story and characters were some completely cliché and derivative. The biggest surprise though was when the book ended without any of that and without a single unique or interesting idea. I've read a lot of books both good and bad but never have I read something so completely worthless. Here's a quote from the book that sums it up: "The grumpy man grumbled" - Craig Alanson ARE YOU FREAKING KIDDING ME!!! That's my favorite, but there so, so many more. The antagonists throughout the story are called, wait for it, "the enemy". I kid you not! And that phrase "the enemy" appears more often than any actual description of this horrible evil force making it impossible to care about the centuries old struggle between good and evil. The entire book is full of characters that my 8 year old son would find contrived. I couldn't create such shallow, uninteresting characters if you paid me and by the end of the book the only emotional investment I had in them was a profound disgust for their universal stupidity. The fantasy world that hosts the story is also pitifully bland. The author has just taken stereotypical cultures from around the world Chinese, African, Arab, Hispanic, Irish, etc. and given them new "fantasy" names. Their garb, their accents and even the food they eat is exactly what you would expect from their corresponding cultures IRL. 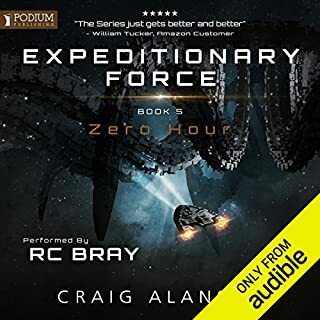 Finally, the narrator droned on at such a slow pace that I was only able to get through the entire book by cranking up the speed. Letting it play in real time would have drained my will to live. I honestly cannot believe that anyone could enjoy this drivel. 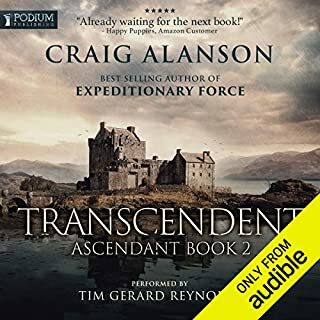 Again, it was an immense shock to me after enjoying Alanson's other series so much. 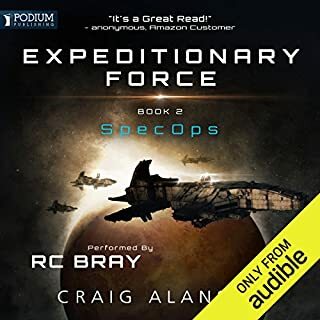 My advice, if you are a Skippy fan, look elsewhere; If you are a literary fan, look elsewhere; If you have to choose between listening to this audio book and being water-boarded, take my advise and go with the water-boarding!